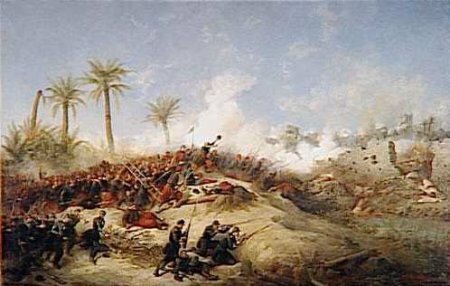 On this date in 1849, the French imposed a salutary example on Islamic resistance in Algeria. Bouzian — or Bou Zian, Bou-Zian, or Abu Ziyan — led an uprising rooted half in resentment over confiscatory palm date taxes and half in a prophetic insurrectionary Islam that sure reads as foreshadowing from this distance. Retiring to the defensible oasis village of Zaatcha, the rebels impressively repelled French zouaves sent to suppress them earlier in the year, sending them off to lick their wounds and regroup for several months in the nearby town of Biskra. At last, a massive French force descended on redoubt. Bouzian holds out the longest. The 2nd battalion of Zouaves is on his track; two bags of powder placed against the house which shelters these energetic defenders produce no effect; only at the third does a mass of wall come down. Our soldiers of the different columns of assault rush in. They are received with musket-shots. Every one of the close to 1,000 Arabs defending Zaatcha died — several dozen, at least, besides Bouzian summarily executed upon capture — and they took two hundred or so of the assailing force to the grave with them. John Reynell Morell emits an non-partisan Orientalist tribute to everybody in this public-domain book about Algeria published shortly after the bloody affair. What impartial pen shall chronicle the panting despair of those dauntless Saharians, fighting to the death for wives and home, and waving palms and liberty! what pen do justice to the gallatry of European discipline, establishing order amidst blazing temples and blood-stained gardens! The sweet South will continue to sigh its perfumes over that oasis; but its gardens are a wilderness, its homes a desolation, for the spirit of freedom has left it. Those perfumed sighs, though, would not in the long run prove such an ephemeral matter for the Republic. General background on the Siege of Zaatcha is here (in English) and here (in French).